Boring Breasts? 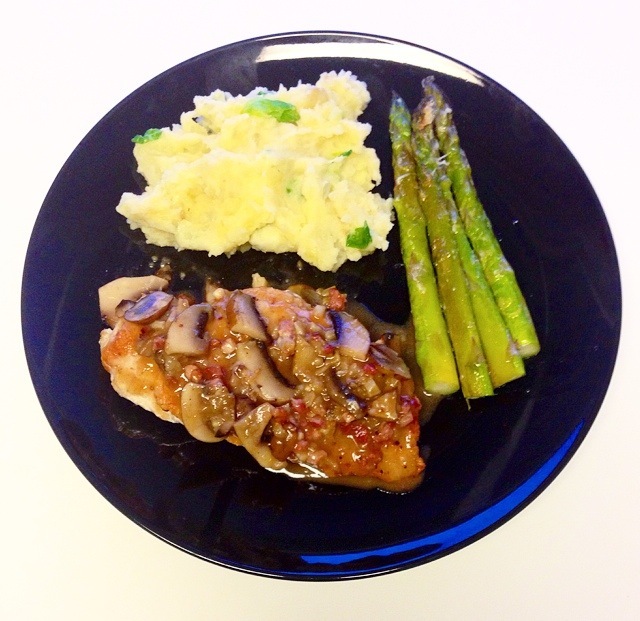 Never: Chicken Breast with a Mushroom White Wine Pan Sauce, Roasted Asparagus, and Olive Oil Smashed Potatoes – Pao Says, "Open Wide!" Once again, a different type of chicken breast! To cook, I coated a stainless steel pan (don’t use non-stick because you won’t be able to make a pan sauce with it) with some olive oil. Put it on med-high heat and cook the breasts for about 3-4 minutes on each side, depending on the thickness- you’ll want to see a golden-brown crust when you go to flip the chicken. Set the cooked chicken aside and put the butter and a drizzle of olive oil in the pan along with the pancetta. (If you don’t have this, the sauce certainly won’t be ruined, you can just skip this step). Toss in the chopped garlic and mushrooms and make sure they’re coated in the oil. Once the garlic starts to get some color to it (careful not to burn it! ), add the white wine to deglaze the pan. At this point, scrape off the flavorful bits on the bottom of the pan that formed from cooking the chicken and pancetta. This will reduce down to a nice sauce in about 3 or so minutes. If you like a thicker sauce, you can whisk in a tsp of flour while you’re cooking it. Pour the sauce over the chicken and you have an exciting breast in front of you! The asparagus was quick and easy- I preheated the oven to 425, rolled the asparagus around in some olive oil, sprinkled some garlic salt and Parmesan over the top, and roasted it for 15 minutes. I made the chicken while the asparagus was in the oven. The potatoes: just boiled some potatoes (I cut them into half inch cubes so that they cook faster) in salted water. Once my chicken was cooked, so were the potatoes. I drained them and mashed them with some Parmesan cheese, chopped chives, butter (about 1/2 tbsp per serving), splash of milk, and about a tbsp olive oil. Since they were boiled in salted water, I didn’t need to add salt here. They’re bomb smashed potatoes. Das it! Dinner is served! !